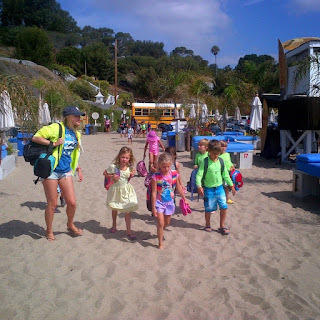 Los Angeles Summer Camp | Aloha Beach Camp Blog: What's the Procedure for Walking Campers from the Bus to the Beach Upon Arrival at Camp? What's the Procedure for Walking Campers from the Bus to the Beach Upon Arrival at Camp? A parent emailed us today asking a question we've never gotten before. Usually we hear many of the same questions fairly regularly, especially regarding camp transportation to which you'll find most answers on our website faqs. But today's question was different, unique. The parent wanted to know how our procedure for walking campers from the bus to the beach area where we set up camp upon arrival at the beach. Great question, and pretty simple answer! Counselors always accompany campers from the bus to the beach each morning, and back again in the afternoon. The kids are never on the bus alone, and never walk back and forth from the bus to our campsite area on the sand or vice versa. In general, two counselors typically rides each bus with the kids. Upon arrival at the beach, the first counselor one counselors exits the bus first before anyone else, then the kids exit, then the additional counselor. Then everyone walks together from the bus to the area on the sand where we set up. Everything works pretty much the same way in the afternoon. The counselors walk the campers from the sand to the bus. One counselor enters the bus first, then the kids board the bus, then the additional counselor. Simultaneously, counselors are taking role while making sure the kids have all their belongings and wearing their seat belts in preparation for the ride home. One additional item of note. In the vast majority of cases, the bus parks within just a few feet of where we set up camp, so the kids only have to walk a few steps from the bus to the beach site location and back again. Paradise Cove (pictured above) is generally the only program activity site we visit where campers need to walk some distance between the bus and our campsite on the sand. But even that's not too bad, not more than 100 yards or so. Staff walks with the kids in case they need help carrying their backpacks, etc.